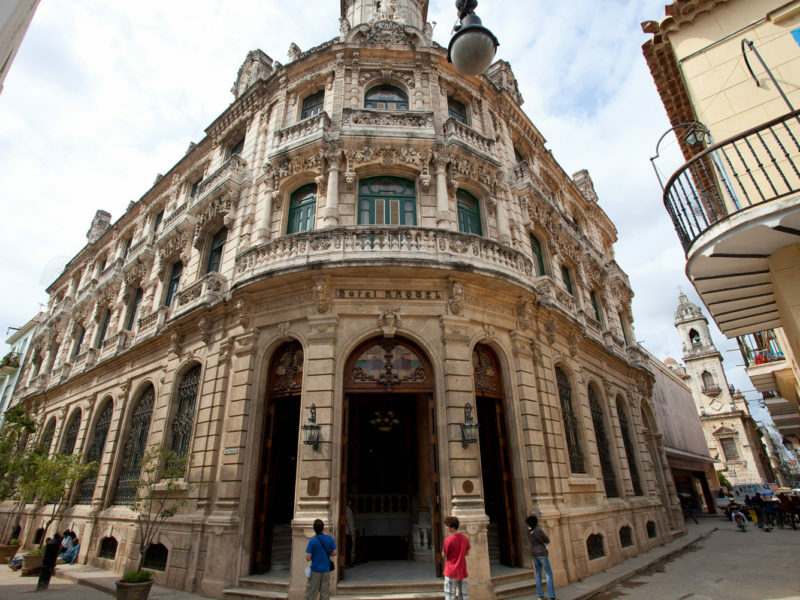 Baroque facade of Hotel Raquel in Old Havana, Cuba. Economically poor, but culturally rich: chaotic Cuba is like nowhere you’ve visited before. Nigel Herbert finds this haven in Old Havana. The quest for communist utopia has extracted a price on Cuba. With over 600 years of history, this port city’s architecture reflects the conquest, occupation and plundering of the victors of the island state. But for many of these buildings it is the end of days. A tropical climate and 50 years of neglect from a centrally planned economy has taken its toll. The Cubans even have a word for it: Derrumbe. It means building collapse. Many of these once magnificent buildings are inexorably decaying from the inside. And it’s heartbreaking to see. 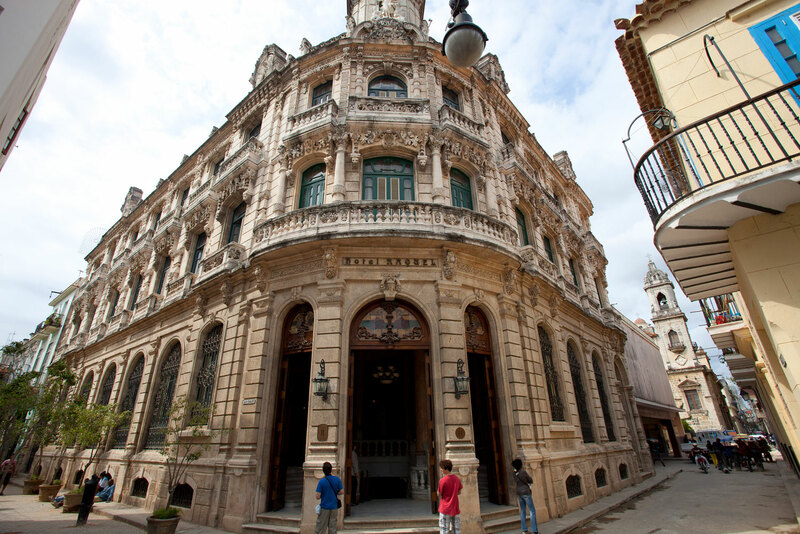 Spectacular buildings that would be preserved by stern faced ladies in Birkenstocks and their bearded husbands in the western world are simply not a priority in Cuba. It’s understandable. People are just trying to do enough to make ends meet with their miserable government stipend. When your biggest concern is how you are going to feed your family – saving something architecturally significant is never going to be a priority. So it’s a pleasure to find one of these majestic old buildings has been lovingly restored and converted into a hotel. After 10 minutes you realise that this is a magnificent chaos. A safe chaos. But just one giant, bewildering mess. As an elderly German confided in me quite conspiratorially “Eeett eez like Berlin in 1946”. And I can only assume he is correct. Hotel Raquel sits with its ornate baroque façade in the ancient cobblestoned streets amongst this chaos. The building feels like Sydney’s QVB was converted into a hotel, then dropped into a Parisian street that was abandoned… at the end of WWII. In fact it was originally a bank built in 1908. Nigel compared Hotel Raquel with Sydney’s QVB building – well, sort of. With its huge vaulted foyer and stained glass roof, the building is spectacular. But unfortunately, like everything Cuban there are contradictions and riddles throughout. For instance, a large number of the rooms in the hotel have no windows. But the bedrooms are large with huge ceilings, air conditioning and a palatial feel. The bathroom is well appointed and there is plenty of storage. There is even a gleaming old-school 34-centimetre TV encased in a cupboard. All in all the rooms feel right. The renovation has been sympathetic to the period – not easy for a hotel that has an ornate brass elevator over 100 years old that you need to open and close yourself. Hotel Raquel’s rooms have the spacious, palatial feel to them. And the service is strange. Everyone on the service staff should be congratulated for their attentiveness, but less so for their working style. For instance, breakfast at the hotel is like breakfast served at almost every other hotel in Cuba: terrible. The eggs are cooked many, many, many hours prior and left to toast in a bain-marie. There might be some tomato if you are lucky. Cuba’s attempt at a western-style breakfast buffet is truly horrible. The bread and the coffee? Divine. But they have been doing that for years. Where it gets really interesting is watching the waiter clear the table next to mine while I eat breakfast. He would go to the table, take a plate and return to the kitchen. Thirty seconds later he was back. To collect another plate or possibly a glass, then return to the kitchen. Anyone who works in the service industry would be mortified, but it’s the Cuban way, as the well dressed man in the Panama hat a few tables away explained to me. A communist country has no real motivation to seek any efficiency. And it percolates into their way of doing business with tourists. So grumbling bell boys and waiters behaving strangely are just something you need to get used to and, after a couple of days, embrace. You want a mojito? The staff at the Hotel Raquel will rustle one up quickly and it will be just heavenly. Mojito, like coffee, is local – something they are used to and can do well. That’s what makes Cuba so great. Sure it’s chaotic, but people are eager to please. Even if it means cooking you horrific eggs. Hotel Raquel, Calle Amargura, No. 103 esq. a San Ignacio, Old Havana, Cuba. see the website. Nigel paid $108 per night for a standard room.